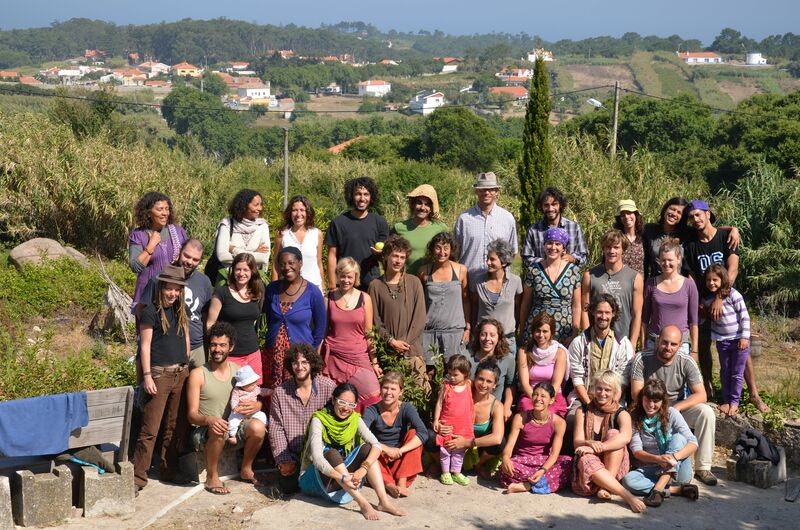 With 15 countries represented at our first 2011 Portugal PDC course held at Escola Da Terra, we are thankful that Sintra and the school itself attracts such a diverse crowd. 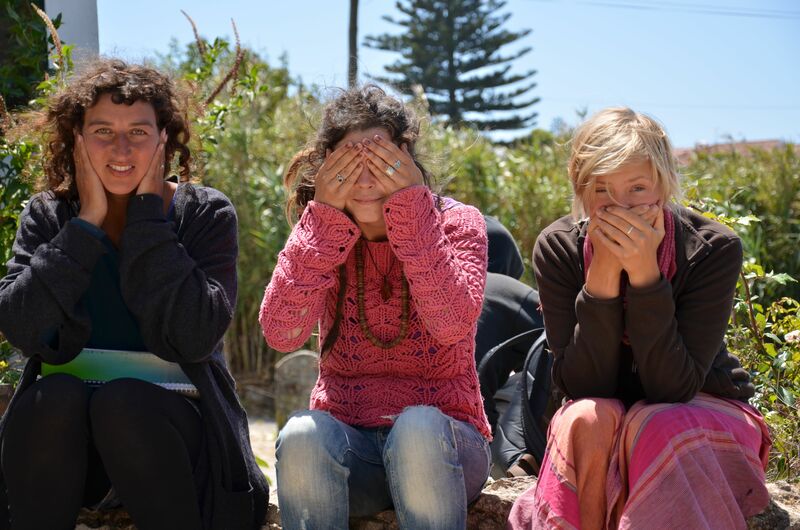 With 31 more students certified in Permaculture, the seeds of change are blowing upon the wind that gusts quite often here in this coastal enclave. We shared in circles honoring circles, learned and laughed quite a bit, and united in this intense but very rewarding two weeks. More often than not, it was the light-hearted character of the students that defined the wonderful vibe emanating throughout. Highlighting the course were the impressive final design projects. The overwhelming dedication and attention to detail by the students was evident in the resulting ingenuity. 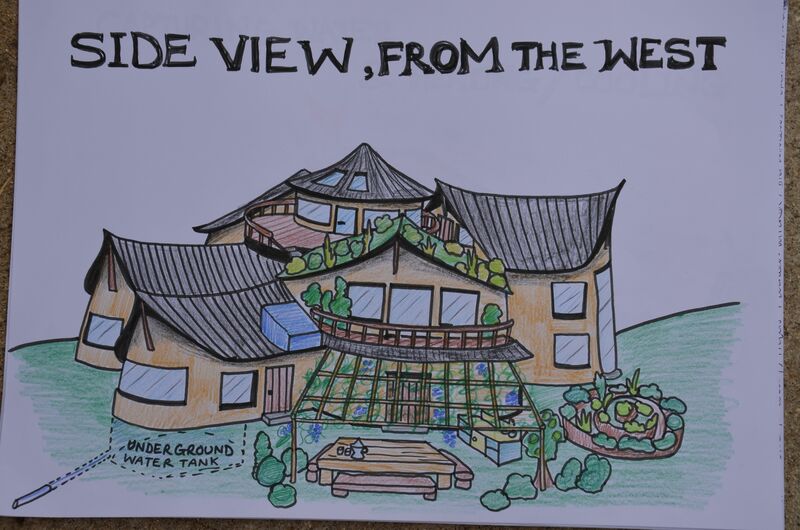 Hours of research and creative input manifested such delightful designs as the following by Melissa Wilson from the UK. Her use of patterns overlapping the design principles bore this nasturtium flower inspired work. Also during this course, the TreeYo team itself evolved. 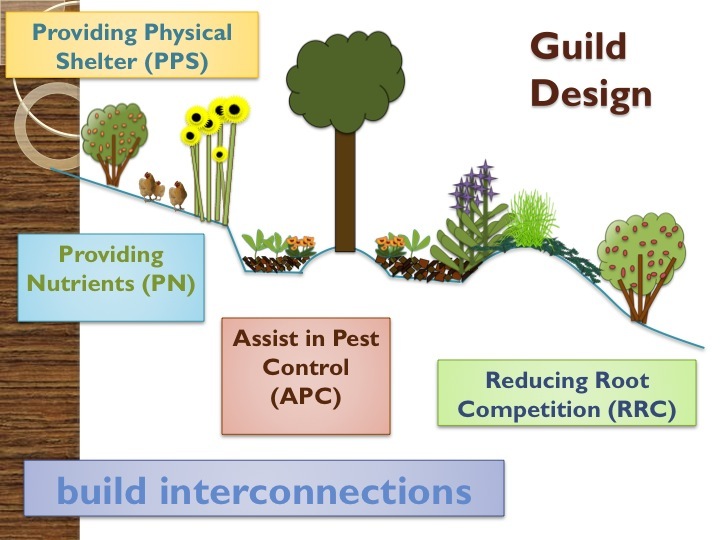 To produce a dynamic program, it takes teamwork. So we incorporated several local guest speakers into the teaching rotation as well as welcomed Eva Wimmer as the the next branch in the tree of “TreeYo”. Many thanks to Eva for stepping in to assistant whenever needed and also for contributing behind the scenes. After getting her first official TreeYo PDC under her belt, we look forward to her increased confidence and participation in upcoming courses. Gautier also shared an inspirational quote from Masanobu Fukuoka: “The ultimate goal of farming is not the growing of crops, but the cultivation and perfection of human beings.” Other guest speakers contributing to the overall success of the course were Isablel from the local Cooperativa, Pedro from the Escola with bees and worms, and Eunice Neves leading a session on drawing techniques as well as assisting students with final design projects. Another fabulous contribution was from Silvia Barbosa who is a local of the area, who works in the local forest with endangered species. She was in fact a student on this course, however, she stepped up and helped us close out the sessions with a lesson on plant propagation and seed-saving, which highlighted spore propagation of ferns and breaking dormancy of certain tree species. Her enthusiasm is truly contagious and we give her great thanks for sharing it with all of us. Each one, teach one, eh. 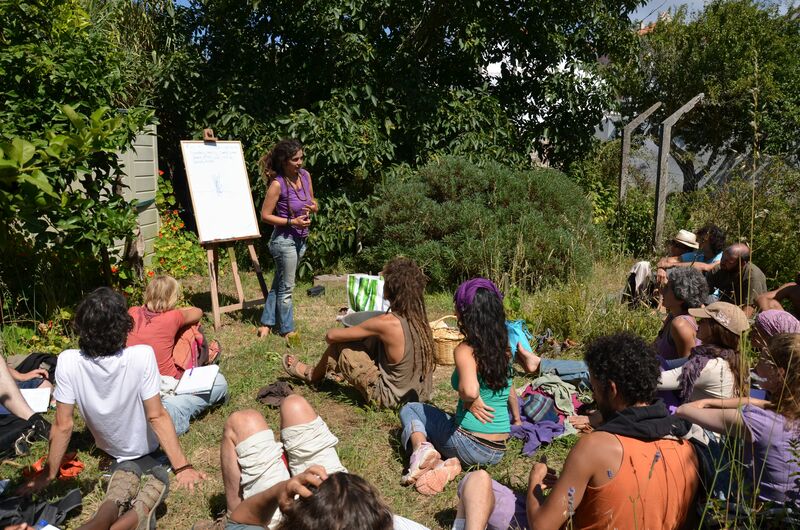 She did a fabulous job and will make a great teacher of Permaculture in the very near future. Also we continued to develop more interactive exercises and spin old ones, such as the Animal Functional Analysis. These exercises allow students to explore topics and learn to drive their own education as well as build on and reinforce information from previous presentations rather than just straight lecture. This format really makes the class more engaging and develops a deeper understanding for students. 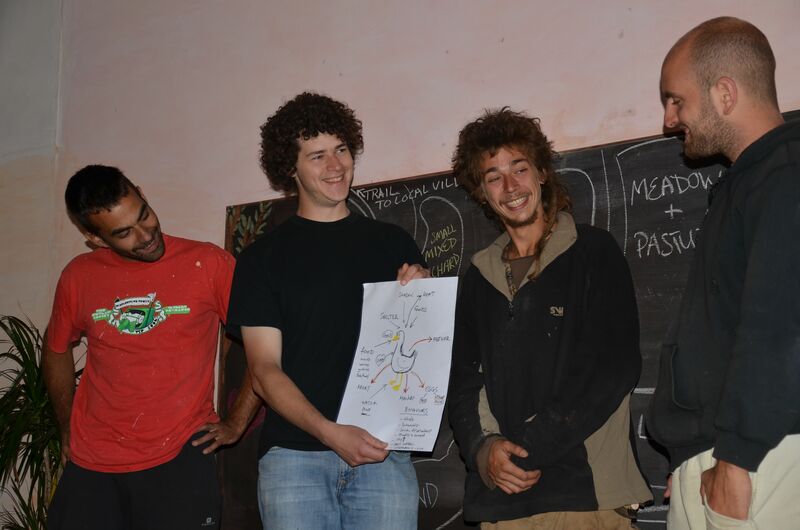 As you can see here in the above photo, students are really enjoying the atmosphere of talking about ducks and generating ideas around the endless opportunities to integrate them into a Permaculture system. After successfully completing the intensive design process by presenting the final projects, we all performed and shared in the “No-Talent” show. While apprehensive at first, the students settled into the silliness and reflective process of this piece of the pedagogy of Uncle Bill. One of the highlights of the show was Ronan “tricking out” his van, permaculture style, on the white board with keyline dams in the sink of the van’s small kitchenette and greenhouses on the sunny dash. As the evening softened the last of the daylight, we moved inside to take in several more creative performances and games of all sorts. 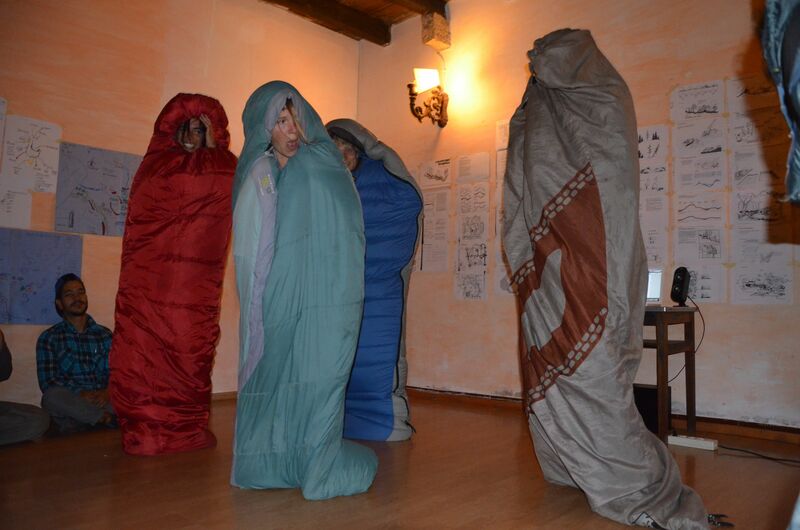 One such performance was the “Wiggle Worms” sleeping bag dance party. Thanks for all the fun and laughter! As always we had some wonderful hands-on sessions to reinforce the curriculum directly into the body. Our first hands-on project involved making a hot compost pile to heat the solar shower Jean Pain style. 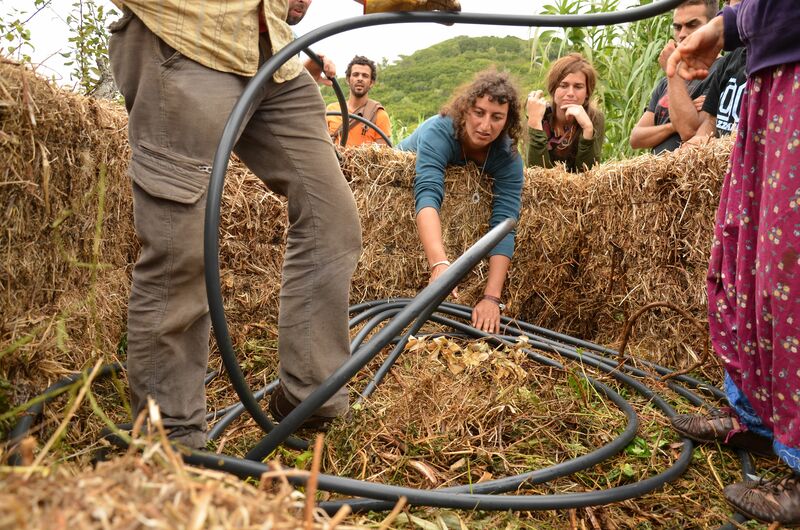 We laid 200 meters worth of black pipe inside a few cubic meters of compost that was insulated with a wall of straw-bales. It worked really well for a few days but the heat did ultimately taper off. Most likely the contents of the pile needed to be chopped more finely and packed down more compactly. Really stomping it down and chopping the material up with a machete would keep the pile anaerobic and thus hot. That was the brilliance of Jean Pain’s chipper then shredder machine with all the organic matter that he was cycling out of his forest. To be successful as a heat source longer term, the pile needs to be compressed to eliminate oxygen flow and causing the anaerobic decomposition which causes the prolonged heat to occur. 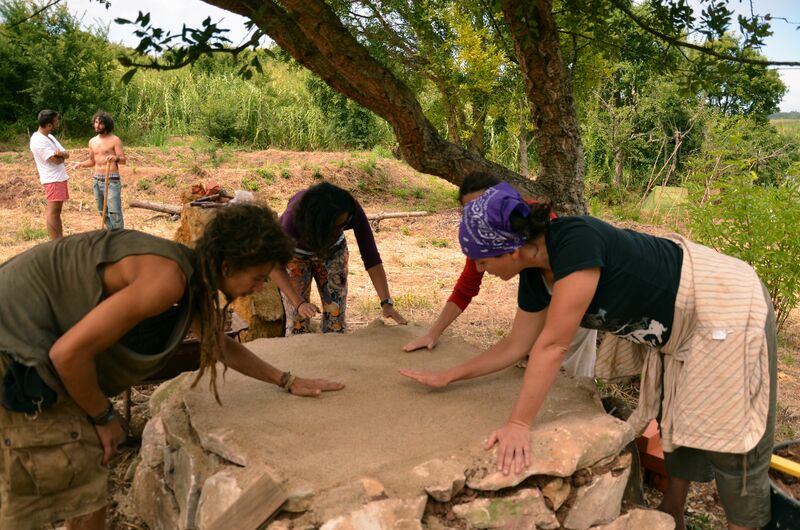 We also managed to do some natural building with the initial installation of a cob oven. The stone foundation went up beautifully but the creation of the sand dome for the inside chamber proved to be more challenging than expected. The sand needed to be a finer grain to be sufficient for our needs. So keep that in mind when building your cob oven! Just down the hill from the cob oven build, student got the chance to experience the wonders of sheet mulching! 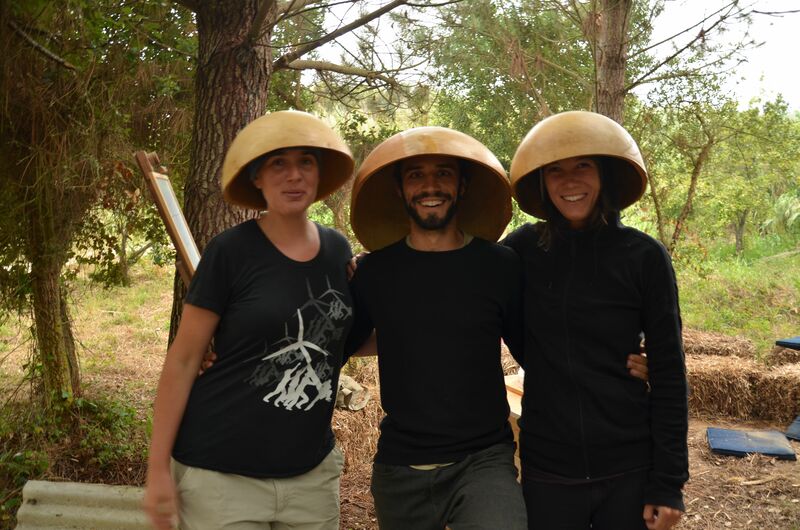 We first watered and broke the soil with an especially effective local tool called an enchada (large hoe). Next, we laid multiple layers of soaked cardboard all along the top of the raised beds ensuring ample overlap. Then we collected horse manure and other organic matter from the road to create a thick rich layer on top of the wet sheets of cardboard. 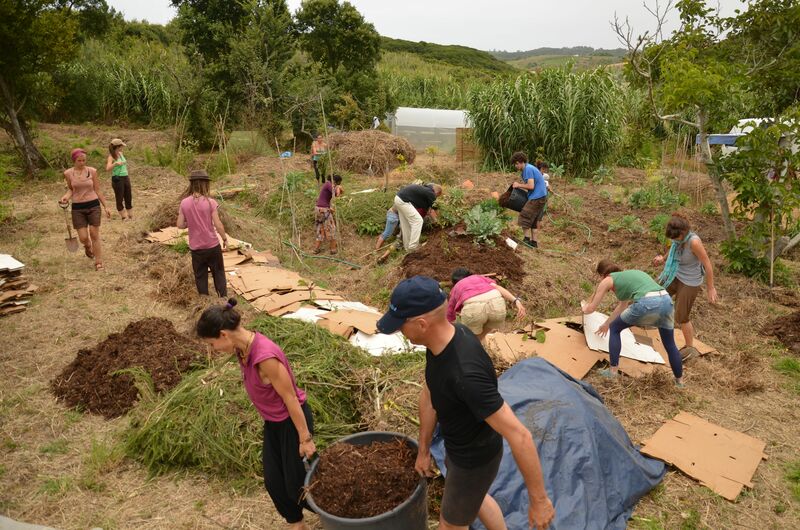 Here in Portugal, like many places around the world, endless amounts of organic matter are discarded by people everyday and we, as Permaculturalist, are happy to transform this waste-stream into soil for the garden and heat for the shower. Another small adjustment we made to the class schedule was to move the fermentation session up to earlier in the course. 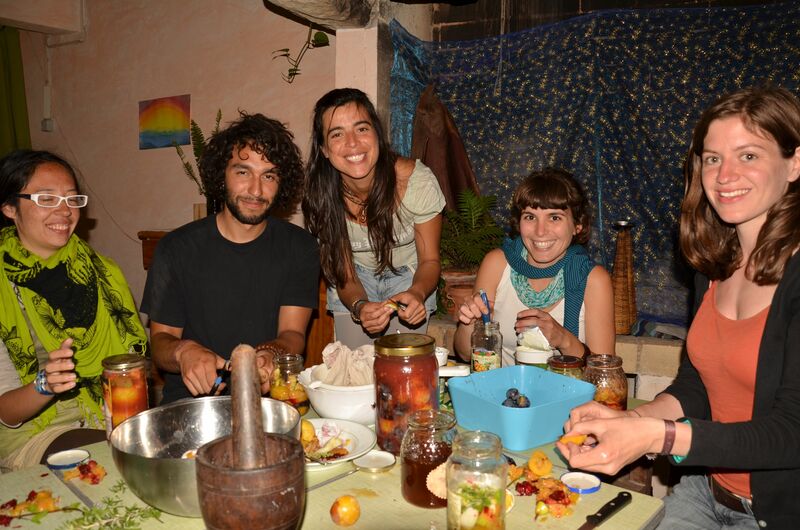 We strongly believe in the health giving and energy-saving properties of fermented foods, not to mention its inextricable link to Permaculture. Thus on day 4 of 14, we made naturally carbonated drinks from ripe plums, pickled cucumbers and nasturtium seed-pods, salted cabbage and root crops to make sauerkraut and kimchi all through fermentation techniques. By the end of the course we had enjoyed the delights of the fizzy drinks and the tangy tastes of the sauerkraut. Students really enjoyed seeing the process unfold from beginning to end. One student even explained later after tasting the creations, that she was so thankful that we had demystified something she had always wanted to get into. That is the point of it all…to free the will of students, to let go of fear, and to learn, learn, learn. So a special thanks to all the students for an amazing course! It truly was a lot of fun and a great exploration, all at the same time. Até ja!